The ubiquitous branding of Will Smith™ over the past several years—from his son becoming a karate kid to his daughter whipping her hair back and forth—camouflages the fact that the erstwhile Fresh Prince hasn’t starred in a movie since Seven Pounds four years ago, marking the first time he hasn’t released films in consecutive years since 1995. Men in Black III comes ten years since the last sequel, and the time away hasn’t been kind to the subfusc-clad odd couple tasked with protecting Earth from the scum of the universe. For some reason, Agent J (Smith) remains preoccupied with trying to figure out why Agent K (Tommy Lee Jones) is so surly and K is still reticent about telling J intimate state secrets, problems you’d think the duo would have resolved over their 14-year partnership. Agent J travels back to 1969 to save his taciturn partner from being killed by Boris (Jemaine Clement), a snarling fugitive who escapes from a moon-based prison and also looking to time jump in order to exact revenge on K for shooting his arm off 40 years ago. At first, the whole plot feels like an artifice built around the gimmick that Josh Brolin, playing K circa 1969, can do a killer Jones impersonation. In truth, the 65-going-on-85-year-old Jones (and his bad makeup job arises suspicions that K is actually an alien) isn’t able—or willing, judging by his palpable disinterest—to carry the entire movie, so Brolin enters to share the comedic load with Smith and the proverbial cast of cosmic creatures. Still, I’ll take three minutes of Jones’ deadpanned wit over Brolin’s mimicry, which eventually devolves into just calling his partner “Slick” about two dozen times. But the principal problem with any Men in Black sequel, particularly one as lifeless as this, is the lost sense of discovery that made the first film so hip. Now, all those carnivorous aliens disguised as humans, memory swiping, shiny shooting gadgets and Danny Elfman’s insistent score seem more like pastiche stripped of its once zippy vibe. And time travel back to the 1960s? You may as well just watch Austin Powers again. The ripple effect of alternate timelines, illuminated via a clairvoyant creature named Griffin (Michael Stuhlbarg), quickly becomes the narrative’s focus and albatross. It’s a concept rife with potential but entirely belonging in another film. Moreover, its execution litters the story with gaping plot holes and throwaway characters. Emma Thompson plays the new MIB boss who shares a decades-old relationship with K that, for some reason, the previous two films never hinted at. Bill Hader provides a too-brief depiction of the “real” Andy Warhol, and Pussycat Doll Nicole Scherzinger helps baddie beau Boris bust out of Lunar Max only to vanish as quickly as she arrived. 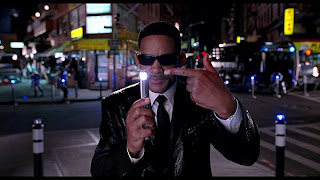 Men in Black III isn’t good, but it also isn’t necessarily awful. Its biggest fault is that it’s unoriginal and dreadful dull. A ticket to see it should come coupled with a Neuralyzer so filmgoers can zap their brains when the closing credits start rolling and forget everything they just saw. I didn't really have any interest in seeing MIB 3, and now have even less. Nice review of what sounds like a pay cheque film for Will Smith.